Heilind is now offering Hirose’s ix Industrial Series I/O connectors, designed for high-speed transmission in smart manufacturing applications. Heilind Electronics, a leading global distributor of electronic components and authorized distributor for Hirose, has added the manufacturer’s ix Industrial Series I/O connectors to its extensive inventory of industrial interconnect products. This next-generation connector is compliant to IEC PAS 61076-3-124 standards and facilitates Industry 4.0 automation and data exchange in manufacturing technologies. 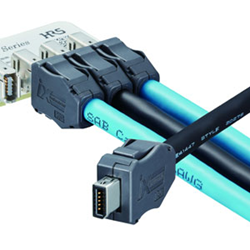 The ix Industrial Series connectors feature a 75 percent size reduction over standard RJ45 jacks, along with higher speeds of 1 Gbps for Cat5e cables and 10 Gbps for Cat6 and above. In addition, these robust connectors exhibit high EMC (electromagnetic compatibility) resistance and withstand mating cycles of 5000 insertions and withdrawals. The PCB-mounted design of the ix Industrial Series not only promotes a secure connection, but also protects contacts. Both signal contact SMT (surface-mount technology) and PIP (pin-in-paste) allow for reflow mounting. Hirose’s ix Industrial Series I/O connectors are used in a wide range of industrial and computer applications, including switches, machine vision, PLCs (programmable logic controllers), industrial robotics, security systems and drones. Visit Heilind's website for more information about Hirose ix Industrial Series I/O connectors.